The most interesting note here isn’t the tag match itself, but rather that Akai Saki is the Iron Man Heavymetalweight Champion. The Iron Man Heavymetalweight Championship is a belt that is defended 24/7, meaning that Cherry can pin Saki anytime to win the title even though they are partners. Which she will try to do a lot. Saki is a known model in Japan, a gorgeous one at that, but is a regular wrestler in DDT. Cherry is also DDT-affiliated and is an eleven year veteran. Cherry attacks Saki before the match even starts, which kinda sets the tone for how this one is going to go. Cherry lariats both Oishi and Katsumata and she scratches Katsumata on the back. Cherry tags Saki, Katsumata slams Saki and he tags Oishi. Oishi drops a fist onto Saki and he tags Katsumata back in, Katsumata puts Saki in the ropes and he dropkicks her in the face. 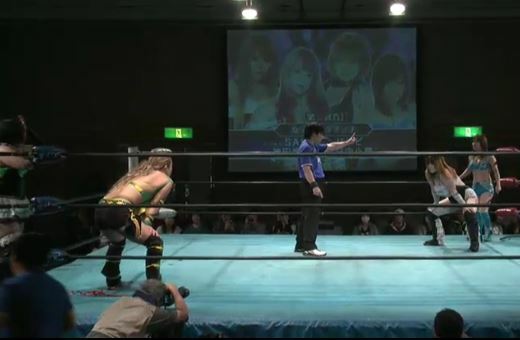 Cherry breaks up the pin and goes for her own pin on Saki, but Saki keeps kicking out. Big boot by Akai on Katsumata and she boots him again, but Cherry runs in and rolls up Akai for a two count. Akai boots Oishi also and tags Cherry, they both kick Katsumata before Cherry chops Oishi in the throat. Cherry rolls up Akai, but Oishi rolls her over and covers them both for the three count! Oishi and Katsumata win the match. The carnage continues as everyone tries to pin Akai, but Akai clears the ring. She does a promo but suddenly the celebrity LiLiCo appears and chokes Akai with a chain! LiLiCo chokes out Akai and pins her, and she gets the three count! LiLiCo is your new Iron Man Heavymetalweight Champion! There wasn’t much to this one since it was just a backdrop for the bigger storyline of Akai being the Iron Man Heavymetalweight Champion. The story was well told and the crowd enjoyed it, it was just too short of a match to get excited about. Always a pleasure to see Saki though. One of the unique things about K-DOJO (there are many unique things about the promotion) is they have a full time Joshi wrestler: Bambi. Bambi debuted in 2004 and was trained in K-DOJO by TAKA Michinoku. She has been wrestling there every since, a lot of the time she wrestles men but the promotion does bring in other Joshi wrestlers for her to battle as well. Her partner Hinata is itty bitty and debuted in 2013. She has wrestled in several promotions, including teaming with Miss Mongol in the latest version of FMW. 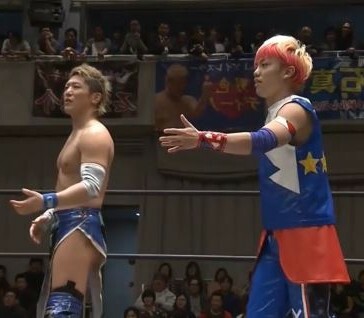 Kanda also debuted in 2013 and wrestles mostly in smaller promotions like Ganbare Pro-Wrestling, KAGEKI, and Secret Base. And finally, SAKI is technically affiliated with LLPW-X, but they don’t run shows very often so she mostly freelances in various smaller promotions. You may noticed a theme, these are pretty low level Joshi wrestlers that K-DOJO brought in to wrestle with Bambi, but for an undercard on a small K-DOJO event that is to be expected. Bambi and SAKI are the first pair in, they try to knock each other over until Bambi connects with a big boot. Bambi tags Hinata and Hinata throws down SAKI by her hair. SAKI tags Kanda, Hinata dropkicks Kanda but Kanda slams her to the mat, SAKI is tagged in and she throws the little Hinata around the ring. Kanda takes a turn on Hinata as well, and she stretches her on the mat. Hinata hits a spinning headscissors to get away and she tags in Bambi. Bambi knocks down both SAKI and Kanda, they go for a double suplex but Bambi blocks it. Bambi gets her whip and whips both of them with it, but SAKI rolls her up for two and applies a stretch hold. Rocking Horse by SAKI to Bambi but Bambi hits a neckbreaker and tags Hinata. Hinata comes off the top with a diving body press, getting a two count on SAKI. Bambi comes in and helps Hinata kick SAKI before tossing Hinata down onto her. Hinata elbows SAKI into the corner, Hinata sneaks in a few pinfalls but SAKI kicks out each time and hits a bodyslam. Giant Swing by SAKI and she applies a single leg crab hold, but Hinata makes it to the ropes. SAKI goes up top but Hinata avoids the Reverse Splash and hits a dropkick. SAKI and Hinata trade elbows but Hinata hits a step-up hurricanrana. Vertical suplex by SAKI and she tags in Kanda while Hinata tags Bambi. Bambi and Kanda trade elbows, Northern Lights Suplex by Kanda but it only gets two. Neckbreaker by Kanda and she delivers a sliding lariat, but Hinata breaks it up. Big boot by Bambi and she nails a second one, Bambi slams Kanda in front of the corner and she nails the Bambing Body Press for the three count! Bambi and Hinata win! One of the downfalls of having wrestlers that are not familiar with each other and not very experienced in general is the matches tend to have miscommunications. There were plenty of those in this match, from small things to bad botches. When they were on the same page the action was fine, but overshadowed by the mistakes. I have grown to like Hinata the bit I have seen of her, little wrestlers that can take offense tend to enhance matches, but overall not a good match. While this may seem random, Makoto came up through Ice Ribbon when Mr. Gannosuke was a trainer in the promotion, so they likely have maintained a relationship since then. Kato is a regular in Stardom but is not officially affiliated with the promotion, so she wrestles on some indy events as well. Kato elbows Makoto and hits a quick crossbody, but Makoto comes back with a shoulderblock and throws Kato in the corner. Dropkick by Kato and she hits a face crusher, but Makoto hits a bodyslam. Makoto throws down Kato by her hair and stands on Kato in the corner, Camel Clutch by Makoto but Kato gets to the ropes. Makoto runs at Kato but Kato avoids the somersault attack and applies a hanging armbar. Dropkick by Kato and she hits another one, getting a two count. Cross armbreaker by Kato but Makoto gets to the ropes, they return to their feet and trade elbows until Makoto knocks Kato to the mat. Makoto goes up top and hits a diving crossbody, picking up a two count. Cartwheel kneedrop by Makoto, she gets on the second turnbuckle but Kato tosses her back to the mat. Sleeper by Kato and she slaps on the cross armbreaker, Makoto rolls to her stomach so Kato applies a short armbar instead. She goes back to the armbreaker, but Makoto wiggles to the ropes and forces a break. Kato picks up Makoto but Makoto boots her hard in the chest, double underhook suplex hold by Makoto but Kato barely gets a shoulder up. Makoto goes for a spear but Kato quickly rolls her up for two, satellite cradle by Kato but it gets a two as well. Kato goes off the ropes but Makoto plants her with a spear, Rising Star Suplex by Makoto and she gets the three count! Makoto is your winner. No hidden gems here, folks. Makoto vs. Kato was a solid match that I enjoyed, but the other two are skippable (unless you must see every Iron Man Heavymetalweight Championship win). There may have been other entertaining matches on the cards, but the Joshi matches are nothing to go out of your way to see.